Last updated 10 May 2017 . By Katie Houghton. Kennington for me has always felt like the space between. While I once visited a hidden magic show, heckled at vampires in a basement and have had a few half-pints there, it's always seemed like thoroughfare on the way down to Oval, Brixton or Clapham. When I was invited down to The White Bear I expected a quiet retreat that London might have left behind, I found anything but that. Tucked neatly in between terraced housing on the road opposite from Kennington Station, the sign to The White Bear is a beacon to one of the only boozers on that strip. Busy from the moment we stepped in, The White Bear must be an illusion or some kind of tardis, pretending to be shy but shouting behind the scenes. Eclectic and unflinchingly cool, I love the effort that the venue has taken to instil the ultimate in shabby pub chic. While an island bar of rich-blue hue dominates the front space, it's the pull of muted green and the cutesy beer garden that had us settling into the dining space at the back. 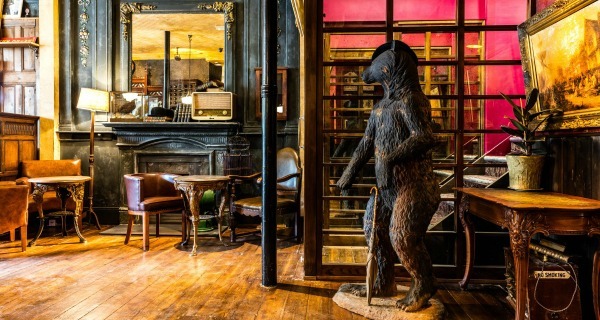 From vintage trinkets and historic nods to dust-laden books and gilded frames, I'm of the mind that The White bear pretends to have gathered this clutter over a mulling of decades, but really put in the effort into creating an almost antiquarian space on purpose. Eclectic but classic, The White Bear promises rustic charm with a fun edge. With Young's behind the name and venue, it's of course British dining that stands out, I just didn't know that British dining had it so damn good. Starting with a wild garlic and spinach soup with garlic croutons alongside a Cornish crab cake, Jerusalem artichoke, samphire, capers (£7), I can't fault the blend of flavours in both. Clearly geared to gathering ingredients from our fair isles, the savoury notes and salted samphire refused to let the dishes down, with both reasonable in size yet firm in rustic presentation. Something else to go with your starter? I can't recommend the house white enough. Sweet and punchy, it's light enough to go with what was sure to be three dishes of serious, savoury business. For mains, it was time to see what the mushroom and broccoli hot pot with a pine nut salad (£12) and the Cornish bass, salsify parsley root and sea purslane could do. Back to Cornwall once more, and I can see why. Not only was the bass perfectly cooked with that beloved crisp skin, the salsify parsley root was a firm and rich accompaniment to the dish that left jersey royals at the door. My boyfriend was equally impressed with the hot-pot. Bubbling in an iron pot on arrival, the freshness of mushroom was the clear, broccoli not too overpowering, and paired perfectly with the bite of pine nut. I owe a whole paragraph to the cheese board. I really, really do. As someone who's only avoidance of veganism stems from cheese, it's the board at The White Bear that shows why. Building our own cheese board with a suggestion of selected additions from our server (5 picks at £15), we had award-winning options on our hands. Some of the stand-out names include the Lord London (there's your award winner) with it's semi-soft touch, and the muslin covered Montgomery Cheddar that would give hard cheese lovers all the glory. Gastro dishes take on a new level at The White Bear thanks to their attention to detail. I owe Kennington quite the apology. While I thought it was the epitome of a hale bay rolling past during an awkward moment, it actually boasts a bellowing boozer that's begging to be heard. 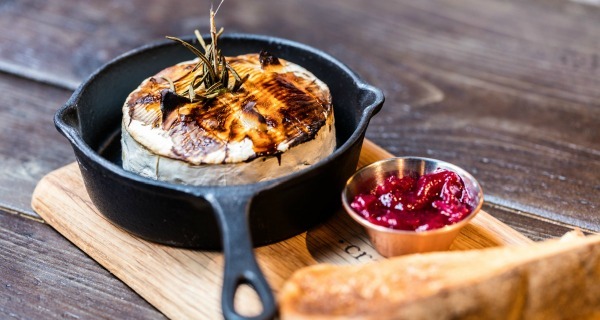 The staff at The White Bear were sublime, the cheese board deserves the utmost credit and the chefs really have paid due care and attention to a gastro menu that goes the extra mile. Next stop, Kennington. UK Editor at DesignMyNight. Otherwise known on the circuit as Kiki Haze.